CAFE WHA WHO always brings us into town for its famous Caprese Sandwich. It's too delicious to pass up. But if you're looking for a really fantastic selection of drinks, they've also got you covered there. Wonderful wine and mixed drinks, plus a great selection of beers too. Since the wi-fi is free, if you're a road warrior with your laptop you may want to chill out here while you get some work done in a great atmosphere. 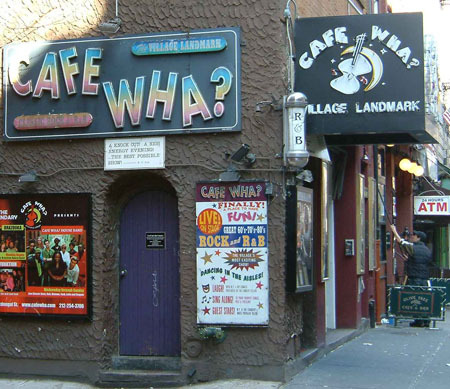 Really excellent cafe and coffee shop as well, and heavily influenced by Cafe Wha in Greenwich Village where Bruce Springsteen, Bob Dylan, and Woody Allen got their start. If you're in town you've definitely got to check this one out.